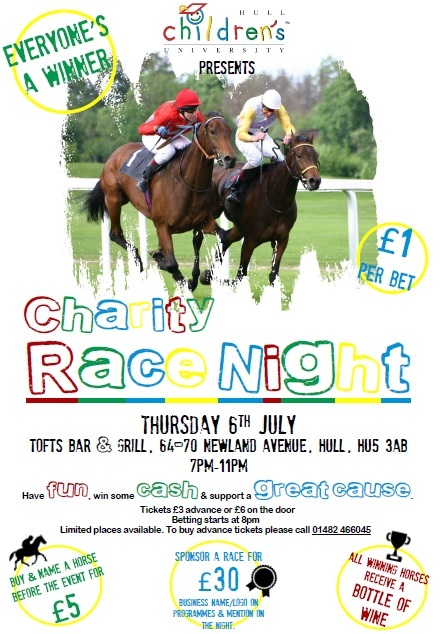 Join us for our next Charity Race Night on Thursday 6th July at Tofts Bar and Grill, Newland Avenue. Place your bets, win some cash and help raise some money for a fantastic cause. Your business can sponsor a race for just £30 and will receive promotion on the night within the Race Programme and also up on a large screen. A knockout visit from Tommy Coyle! 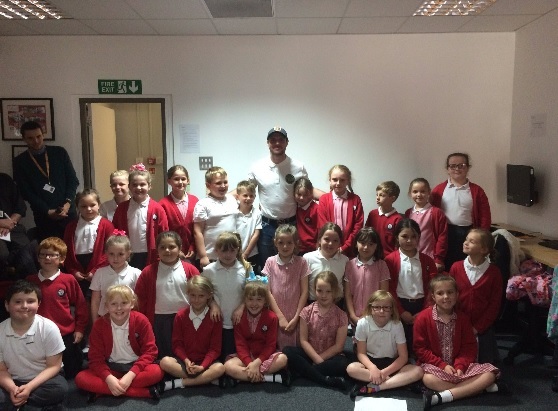 Boxer Tommy Coyle is used to enduring punches in the ring, but he faced a barrage of a different kind when he was interviewed by children taking part in our Ambassadors of Hull experience. 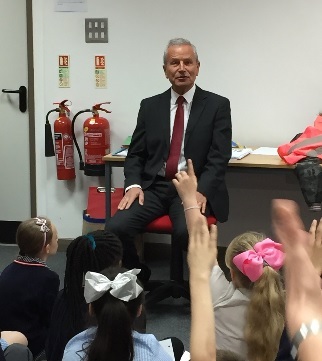 Tommy was guest of honour at KCOM’s Learning Zone on Carr Lane, during which he answered questions from year three pupils from St James’ Academy, in east Hull. Among the questions posed to the 27-year-old fighter were: “Why did you start boxing?”, “Where do you keep your trophies?”, “What would you do if you weren’t a boxer? and “Does it hurt when you get punched?”. After finishing the Q&A, Tommy spent time signing autographs, posing for photographs with the children and dishing out high-fives. “It’s my job to give something back to the community, which has supported me not only in victory but in defeat too,” Tommy said afterwards. Among those to quiz Tommy were eight-year-olds Poppy Edwards and Broady Parker. Poppy said: “I was shocked when I saw it was Tommy Coyle. I watch boxing all the time with my dad and I’ve always wanted to meet a boxer – so to meet Tommy was great. My dad will be very jealous. Broady added: “I was speechless when Tommy walked in. We had been learning about him before he arrived and he’s a really good boxer, so to meet him was special. Tommy also took the opportunity while at Carr Lane to see a van bearing his name, as part of KCOM’s initiative to name all of its 95 vans after famous people from Hull during the Hull 2017 UK City of Culture year. “I’m a kid off the estate that, four or five years ago, was selling fruit and vegetables and now people are naming vans after me!” Tommy said. Peter Levy pays our mini Ambassadors a surprise visit! On Tuesday 9th May, whilst learning about famous Hull ambassadors as part of their Ambassadors of Hull Experience at the KCOM Learning Zone, St Richard’s RC Primary school received a surprise visit from BBC Look North presenter Peter Levy! The children has been imagining what it would be like to interview Peter just before his arrival and were taking part in a pretend interview with one of our volunteers – they didn’t expect the real thing to walk through the door just seconds later! Peter sat down and took lots of questions from the children. Among the tough questions posed at the presenter were: “Who was your favourite teacher?”, “What would you change about Hull?”, “Do you have any pets?” and “what colour did your hair used to be?”. Consummate professional Peter tactfully dodged a question asking him which Hull rugby team he supported and also who was his favourite person from Hull, although the children did manage to discover Peter doesn’t have any pets, that he would like to interview Prince Charles and that he wanted to be a pilot growing up. Year six pupil Rachel Szabo, ten, said she was delighted to meet a real life celebrity while learning what it means to be an ambassador for her home city. Talking about living in Hull, Peter, who is marking his 30th year on the TV this year, said: “I think Hull is fabulous. In the past two or three years it has all really come together in Hull and it is almost unrecognisable from what it was when I first moved here in 2002. As the Year Ten grilling continued, Peter revealed he’d like to see Prime Minster Theresa May visit Hull, that his favourite teacher at school was English teacher Mr Shelton and that he lost his first wobbly tooth at the age of five. Peter is the latest celebrity to take part in the Hull Children’s University Ambassadors of Hull Experience, which is aimed at teaching youngsters about being a positive role model for the city. Former Apprentice winner, TV pundit and Hull parliamentary candidate Michelle Dewberry and former Hull City and England footballer Nick Barmby have both previously visited the learning Zone to meet more school children.